away from Acle with the 12:36 Norwich - Great Yarmouth. DRS have recently supplied Mk2 coaches for this train. 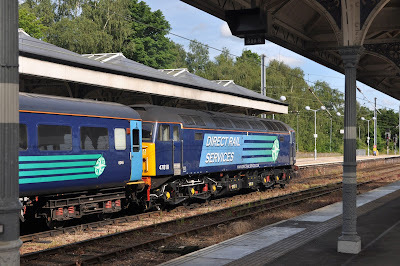 Diesel loco hauled trains have been incredibly scarce across the UK since the wholesale arrival of 'Sprinter' and 'Super Sprinter' DMU's in the 1980 and 1990's. Despite this, somehow the class 47 has maintained a presence, all be it on a very limited basis, in east Anglia. 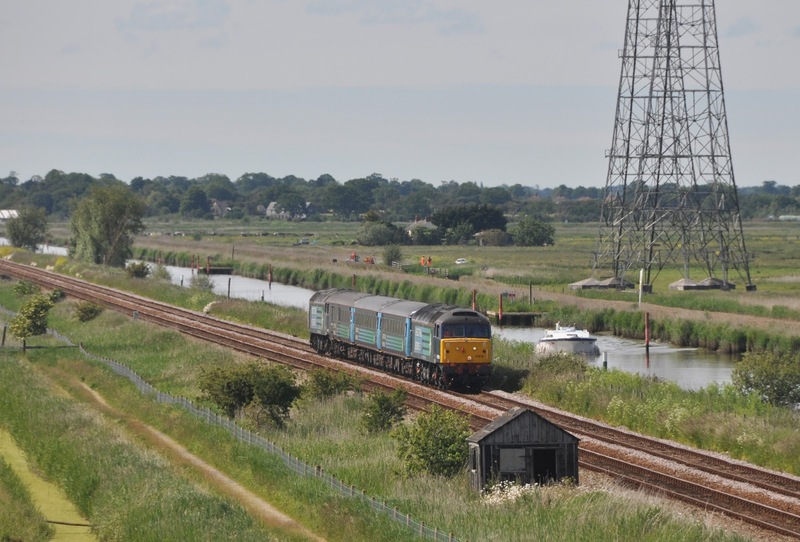 For many years class 47's have been used on Summer Saturdays to drag selected trains from London along the diesel-only line from Norwich to Great Yarmouth. Locomotives also saw use each year on additional trains for the Lowestoft Air Show until this sadly ceased in 2012. 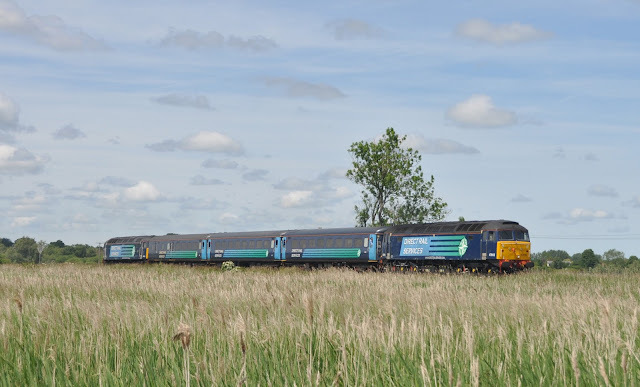 The locomotives have also seen use on 'thunderbird' duties, on some occasions getting the chance to work intercity services from London to Norwich instead of the booked class 90's and have also helped out with diversions during engineering works. 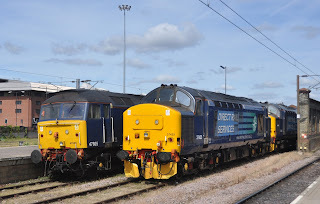 Great Yarmouth to Norwich on 15th June 2015. More recently Norwich has seen a shortage of serviceable DMU's to run it's local services which have on several occasions led Anglian operators to resort to loco haulage on a 'short set' of 3 vehicles split from one of the rakes of coaches usually used on the Norwich to London route. 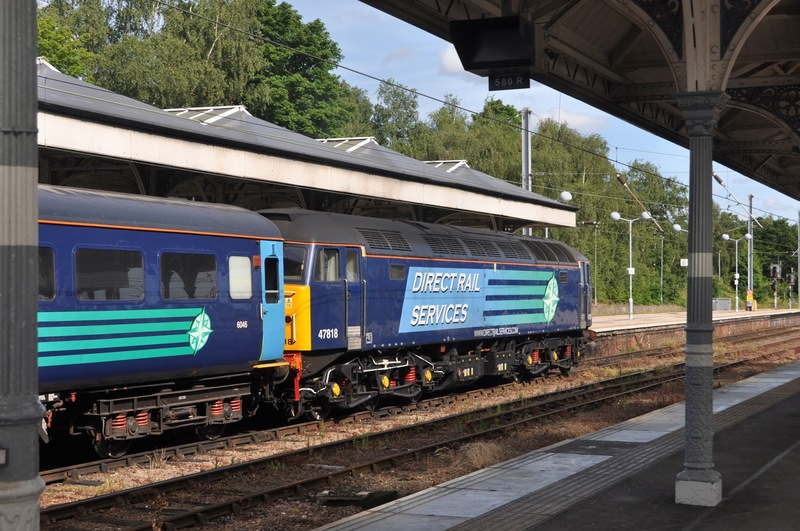 This first happened from 2003 to 2005, but in 2010 Norwich once again found itself short of DMU's forcing the 'short set', top and tailed by class 47's to be pressed into use. It was used on an ad-hoc basis to cover for DMU's (and even saw a class 20 enjoy a day of front line passenger work during 2010) until the workings became more permanent with a fixed Monday to Friday diagram. 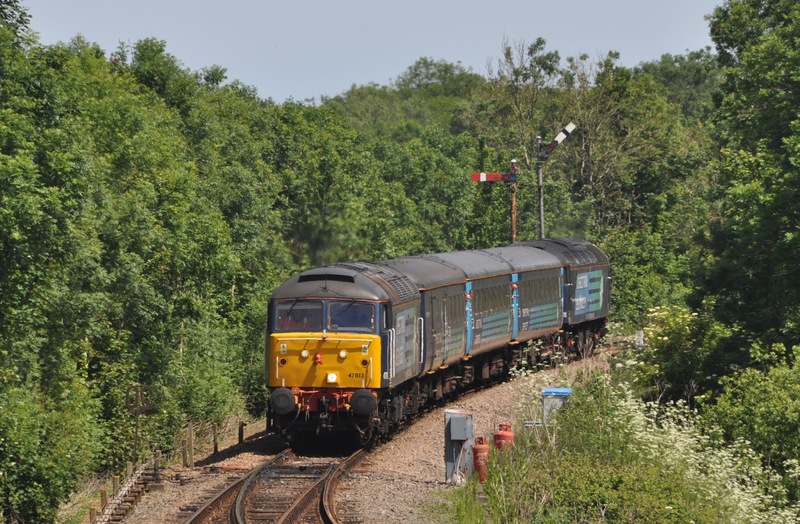 47818 speeds towards Haddiscoe with the 14:55 Norwich - Lowestoft on 15th June 2015.
over duties on the 'short set'- they are seen parked with 47805. 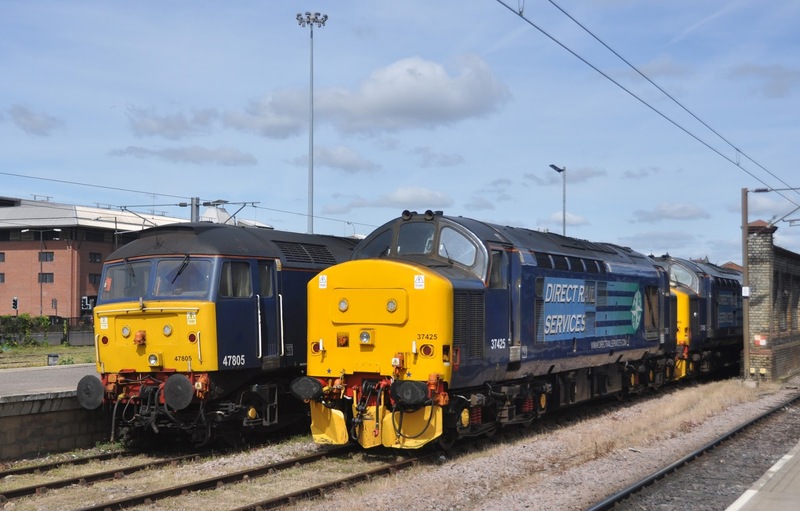 Towards the end of 2014 a deal was reached to retain the loco hauled set to the end of the current Abellio Greater Anglia franchise in October 2016 to cover for a continued shortage of DMU's. The current traction provider, DRS, was however going to implement some changes. The class 47's which had continued to work on the region would be replaced with a class 37/4 from it's expanding fleet, which would work in push/pull mode with a converted DBSO. The date for 37's to start came and went several times, but finally on June 16th 2015 class 47's were removed from the train, and 37405 and 37425 took up their duties. Class 37's will now be the staple traction running with the 'short set' on the beautiful Wherry Lines between Norwich and Great Yarmouth/Lowestoft- for now running in top and tail formation until further DBSO vehicles become available. 15th June 2015 was, therefore, the final full day of class 47 passenger operation in the Anglia area, and for the moment at least, the UK. With new class 68's now on the books of DRS and with class 37/4's in favour for their passenger trains it is unclear what, if any future the remaining DRS class 47's will face. to leave with the 17:36 Norwich - Great Yarmouth on 15th June 2015.